Thanks in part to Tom Paciorek, there’s a term for the borderline between just barely getting by and not getting by at all. 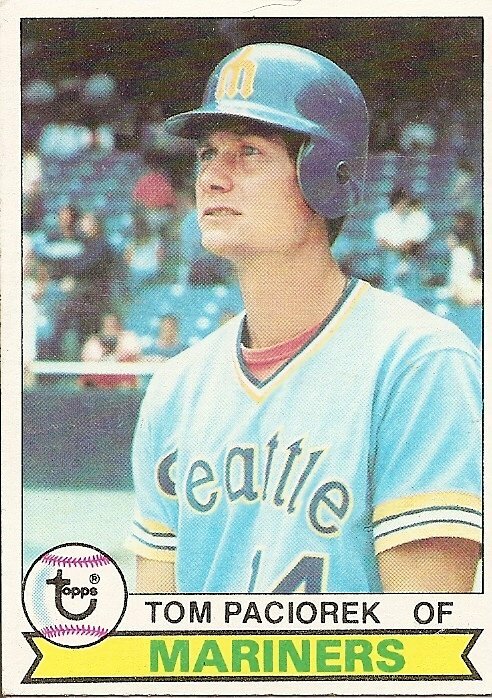 Some say Paciorek coined this term, but Paciorek himself claims that he heard the term—which alluded to the .200 batting average that a Mariner teammate always seemed to be either just above or just below—from a third Mariner, Bruce Bochte. Either way it seems to have been Paciorek, a gregarious type, who started spreading the term around, most significantly passing it along to Royals third baseman George Brett, who shared it with ESPN’s Chris Berman, who carried news of The Mendoza Line to the rest of the world. Oddly enough, this seems to have transpired in 1980, the year Brett ended up making the most serious charge toward a .400 batting average since the last time the legendary mark was actually reached, in 1941 by Ted Williams. Tom Paciorek, like all but two or three living human beings (Brett, Gwynn, Carew), never got close to hitting .400. At the time the card pictured here came out, 1979, he had not hit above .300 in a season either. Conversely, he had hit below .200 once in his career, a mark that may have suggested to Paciorek that the end was always near, which may explain why he so enthusiastically latched onto Bochte’s term. Gallows humor. The most recent year listed on the back of the card shows that Paciorek hit .299. One more hit in 1978 and the 32-year-old outfielder would have cracked that barrier for the first time in his 8-year career. It’s difficult for me to refrain from associating his troubled expression in the photo on the front of the card with the disappointment of just missing that mark. Tom Paciorek finally did hit over .300 in 1981, finishing second in the batting race. At the end of that year I started a tradition, which I only kept up for a couple of years, of cutting out the final Sunday batting average list from the paper and taping it to my wall. So Paciorek was right at the top of that list, just under Carney Lansford. That was the year I stopped buying baseball cards. That was the year my brother went away to school. That was the year I started living more inside my head than ever before. That list yellowed and curled in on itself in the years to come, right up until we sold the house and I threw it away, along with most of the other things on my wall. That sale occurred in 1987, Paciorek’s last year. A professional hitter, he batted .283 that year, one point above his lifetime average. He was 40, the same age I am now. Last night I lay in bed, unable to sleep, feeling as if I had arrived at my age via a high-speed train that I had moments earlier boarded as a 24-year-old. 1. Those old Seattle uniforms look mad cool. I wish more teams would go back to powder blue (and not like the Royals have done it). 2. It’s almost as if that troubled look means that Paciorek sees a glimpse of his future employment with the Chicago White Sox. It can’t be too pleasant being a toadie for Ken Harrelson’s broadcast excesses. I don’t know the circumstances of Paciorek’s departure from that broadcast booth, but his self-respect should be returned by now. If he’s broadcasting elsewhere, it’ll hopefully be devoid of the homer hokum he participated in with the Hawk. J.R. Richard, 1979 (Astros); Derrel Thomas (Dodgers); Ben Oglivie (Tigers). 4. 2 : According to his wikipedia entry he was broadcasting for the Nationals up until last year but his contract wasn’t renewed. 5. There was a QB named Billy Donckers who was the backup for Jim Hart on the St. Louis Cardinals in 1976 & 1977. Those were his only 2 seasons in the NFL. In 1976 he threw 1 pass and completed it. In 1977 he threw 5 passes and completed all of them. He finished his brief career without having thrown an incomplete pass or an interception. 6. Bruce Bochte was someone who was consistently just above or just below the line, but it was the .300 line. 7. I was at a Dodger party at their hotel in San Diego in 1974. I watched Steve Yeager get into a fight with Paciorek’s brother. I can’t remember what it was about, or if it was the Colt .45 brother. Maybe he had other brothers. 8. 5 : That’s interesting. Now I’m burning to know if there’s an NBA equivalent to John Paciorek as well. But I can’t figure out how to search for a guy who might have dunked once or thrown in an old-fashioned kneepads-bedecked running hook in his lone NBA attempt before fading back into oblivion. 7 : Tom Paciorek did have another brother who made it the majors: Jim, but he did not play in the majors until 1987 (he lasted that season only, with the Brewers), so if it was him at the Dodger party that means Yeager was fighting with a 14-year-old. Interesting trio of brothers. One played for one game in 1963, one played for one season 24 years later (! ), and our guy, drafted by the Dodgers in 1968, made sure there was a Paciorek in pro ball for all but four seasons in between. 9. And for some reason the tale of the Paciorek brothers reminds me of poor Larry Yount, brother of Robin. In 1971 he was all set to make his major league debut for Houston. He took the mound, injured himself warming up, and never made it back. He never actually threw a major league pitch, although he was officially in the game and thus made the encyclopedias. 10. 9 : Ouch. And then he had to watch his brother breeze into the bigs without a second in the minors and play forever. Glenn Hoffmann was a somewhat ineffectual shortstop for the Bosox before fading out of the league. His younger brother was set to follow in his footsteps as an infielder but was converted a reliever. He ended up doing OK.
11. The most overshadowed baseball brother I’ve ever seen was in a minor league game at Birmingham, Alabama in about 1974. I was visiting a friend in that city, and when we found out it was nickle beer night at the ballyard, we struck a path in that direction. Coaching third for the opposing team, Savannah, I think, was Tommie Lee Aaron. As the beer kegs rolled in and out of the park at a dizzying pace, the small crowd got more and more rowdy and they heckled T. Aaron about his lot in life…”Hey Tommie, how many homers did you hit?” over and over. Finally, he’d had enough and he yelled back, “I hit nearly 700 fewer homers than my brother….but I hit at least a dozen more than any of you drunks!” I looked it up later and found out that he hit thirteen major league homers…he was right on the money. 12. I went to a White Sox game in the late 80s. The Comiskey gates had yet to open, we were part of a crowd standing outside, when up walks Tom Paciorek in uniform, carrying his spikes and trying to get inside. Did he get dressed at home before games? 13. Tom Paciorek will always remind me of those warm summer nights watching White Sox baseball on WFLD 32 out of Chicago in the early to mid 1980’s. “Pudge” Fisk, Ron Kittle, “Bull” Luzinski, Greg Walker, and who could forget Harold Baines, legendary Brewer killer. All that action was summed up by Ken “Hawk” Harrelson pre-commercial break, as he gave the score and referred to the Chisox as “the good guys”. Does anybody know if Jim Paciorek, the right fielder that at the time unknowingly preserved Juan Nieves 1987 No-no with his 4th inning diving catch, is related to Tom? 14. Does anyone remember Jason Giambi’s brother Jeremy? At one time he seemed regarded with Oakland, but with all the hullaballo over Jason’s steroids, injuries, and his fearsome moustache, he’s been largely forgotten. I think Billy might be the odd man out at Ripken dinner conversations as well. I think the Brewers may be headed down that road as we speak with the free agent signing of Steve Braun, the younger middle infielder of the Hebrew Hammer. I’m hoping it will turn out to be more like a Brian/Marcus Giles thing myself. See comment about the brothers Paciorek in 7 . The Red Sox brought in Jeremy Giambi in the early 2000s to vie for first base/DH time with another uncelebrated newcomer named David Ortiz. Preposterous as it may now sound, I’m pretty sure Jeremy Giambi was initially considered to have an edge over Ortiz for playing time going into the season. 16. some brothers without as much talent..
the great Tom Barrett, brother of shoulda-been ’86 WS MVP Marty Barrett! Jose Canseco’s twin brother Ozzie, had 0 40-40 seasons..but had 3 0-0 seasons! And of course Henry Mathewson, who combined with his brother Christy won 373 games. All by Christy. Q: Which pair of brothers had the most career pitching wins? A: The Mathewsons, with 373. Christy had 373. Henry had 0. I guess the closest modern-day equivalent might be Greg and Mike Maddux — though Mike was a useful middle reliever for the Red Sox for a year or two in the ’90s. Don’t forget Mike Glavine in this discussion, either. 19. Swear t’God, I had no idea Perry was typing his comment as I was entering mine. Jody Lansford, forgotten brother of the forgotten batting champion. And who would be the less talented — Garth Iorg or Dane Iorg? 21. I remember reading that a young Chris Gwynn was way ahead of where his brother had been as a hitter at the same age.